New Government rules mean new ballots have to be held every six months to ensure union members are still in favour of industrial action. Workers at a train maintenance company with sites at locations including Eastleigh in Hampshire are to go on strike in a pay dispute. 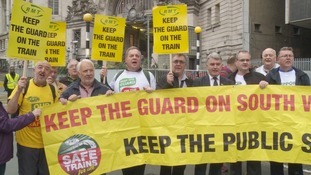 Members of the Rail Maritime & Transport Workers union (RMT) employed by Arriva TrainCare are to stage a 24 hour walkout on Friday 19th May. The RMT said the strike was being held because Arriva TrainCare was not prepared to negotiate pay issues because the RMT was not the recognised union for Arriva TrainCare employees. "RMT members at Arriva TrainCare delivered a massive yes vote for action and the company should wake up and take notice of the anger amongst their workforce over the pay issue. "Instead they have ignored their staff and offered an insulting increase that systematically undermines our members' standard of living. "Our members are entitled to be represented by the union they are members of so we can get on with our job and negotiate decent pay and conditions on their behalf." Arriva TrainCare is based in Crewe and has sites in Bristol, Gateshead, Cambridge and Eastleigh. Rail passengers face "a summer of discontent" if train companies and the Government try to introduce more driver only trains.